Automatic temperature compensation As conductivity depends strongly on temperature, each conductivity value is only valid at the corresponding temperature. Therefore the device supports temperature compensation, i.e. referring the conductivity to a reference temperature (selectable: 20 °C or 25 °C). 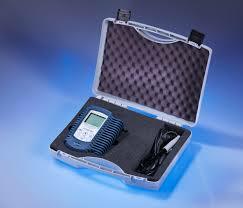 Salinity measurement Salinity means the sum of amount of all dissolved salts in water. The unit is g / kg. TDS measurement (total dissolved solids) TDS means the mass concentration of dissolved media in a liquid. The unit is mg/l.